We collect and use personal information in order to administer or otherwise carry out our obligations in relation to any agreement that you may have with us. Create and inform you of products and services that you may be interested in. In order to do the above, we need to collect and process personal information about you (including your name, address, telephone number and email address). We may ask you for this information on our web site. In order to take advantage of some of our services, you may need to supply us with the personal details of a third party (for example, their name and address if you wish to send them some of our information). We will not use this information for anything other than providing the service for which the information was supplied. We will not disclose any personally identifiable information without your permission unless we are legally entitled to do so (for example, pursuant to a court order or for the purposes of prevention of crime or fraud). You will be treated as having given your permission for disclosures referred to in this policy. This site contains the Google Translation Service which may be helpful to non-English speaking visitors. In some cases this literal transaltion may not reflect accurately the nuances, idiom and syntax of the intended English. We apologise for this and supply the translation service as a "best case scenario" so that you may get a better understanding of our services. Please contact Alan in the first instance before completing any online agreements. 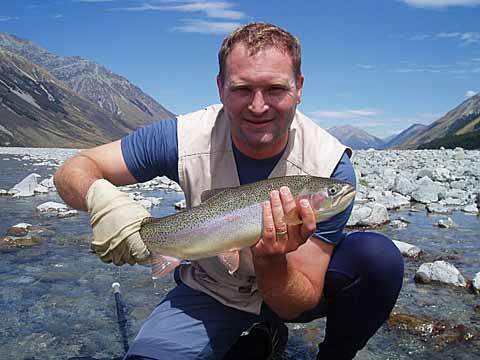 The guiding fees are quoted in New Zealand Dollars, but their is a currency converter on the Guiding Fees and Fishing Trip Services page that will give you an indication only of the costs in your own currency. These may vary depending on fluctuations over which we have no control. This excellent trout was caught in the river!